﻿ F.C Barcelona last week Friday was playing against F.C Porto for the Uefa super cup finals. The first half of the game was dominant in favour of Porto but it didn't make any threat to the Barca defense and the first goal was scored by Lionel Messi on the 39th minute before half time. F.C Porto tried to equalize but unfortunately Barcelona defense again served as barries for Porto to score.Red cards were awarded to two F.C Porto players and it was left with 8 players in the game. With a substitude of Pedro by Cesc' Fabregas was a total surprise for the F.C Porto in the second half of te game. 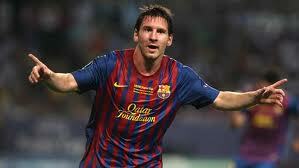 Fabregas stretched the wound by scoring a second goal for Barcelona through Lionel Messi on the 88th minute. The game ended up in a 2-0 scores that led Barca to win the Uefa super cup and F.C Porto players received medals in that game and after that happeness was all over by Barca fans.